The movement to create national parks in the United States to preserve the environment from human encroachment and development began with the establishment of Yellowstone in 1872. Unlike national forests, which are multiple-use areas and can be commercially exploited, national parks are intended to protect flora and fauna in their natural habitats. Suggestions for creating a park in western North Carolina arose in the 1880s. A serious effort was launched in Asheville in 1899 with the formation of the Appalachian National Park Association, but the lumber industry was opposed and the federal government uninterested. By 1924 national opinion grew much more favorable toward preserving important wilderness areas. Seventeen national parks existed by then, but only one, Acadia on the coast of Maine, was east of the Mississippi River. In that year U.S. secretary of the interior Hubert Work appointed a committee to study some 30 proposed sites for an eastern park. Among them were two sites in North Carolina: the Linville Gorge-Grandfather Mountain area and a rugged section of the Great Smoky Mountains straddling the border between North Carolina and Tennessee. Although the latter area was being intensively logged, about one-third of it was still old-growth forest. In 1924 Work's committee recommended establishing two parks, Shenandoah in the Blue Ridge Mountains of Virginia and the Great Smoky Mountains National Park. The following year, Congress authorized the secretary to determine boundaries for the proposed parks and begin accepting donations of land and money. Unlike the 17 previous parks, which were created by setting aside federal lands, these two new ones were to be formed by purchasing lands from private owners. The proposed area for the Great Smoky Mountains National Park, encompassing 704,000 acres, was controlled by more than 6,600 owners. With strong support from advocates such as David C. Chapman, Carlos C. Campbell, and Willis P. Davis of Knoxville, Tenn., and Horace Kephart, author of the popular Our Southern Highlanders, of Bryson City, N.C., a fund-raising campaign began that eventually brought in $1 million. In 1926 President Calvin Coolidge signed a law providing for the official establishment and administration of the park as soon as a minimum of 150,000 acres had been bought and turned over to the federal government. Actual development of the park would only begin when purchases reached 300,000 acres. Besides raising the needed funds to purchase the land, the park's founders also faced the difficulty of persuading all the owners of land within the proposed boundary to sell. Over 85 percent of the area was owned by 18 timber and pulpwood companies who valued their holdings as a source of hardwoods and southern conifers. Most of them were willing to sell their land, but only after they had harvested the timber. Another 1,200 of the targeted tracts were farms of various sizes, many of them family homesteads passed down from generation to generation whose owners were reluctant to sell. Finally, some 5,000 small lots and summer homes lay inside the park boundary. To deal with these reluctant landowners, the state legislatures invoked the right of condemnation. Many landowners, especially the logging companies, fought condemnation in the courts, so the purchase of land for the park dragged on for more than ten years. The resulting removal of residents from their communities, schools, churches, and cemeteries generated hard feelings that still linger among the people of the area. In 1930 a road was built through the park connecting Cherokee, N.C., with Gatlinburg, Tenn., and crossing through Newfound Gap. Four years later, enough land had been purchased to convince Congress to authorize full establishment and development of the park. President Franklin D. Roosevelt dedicated it in a ceremony held at Newfound Gap on 2 Sept. 1940. National parks are administered to achieve two oftenconflicting goals: conserving the land and making it available for public use. Advocates of these opposing objectives fought each other over the establishment of the Great Smoky Mountains National Park, and they continue to argue over its administration as more than 9 million people visit the park each year. Land in the park has been conserved. Its approximately 521,000 acres enclose a wildlands sanctuary at its lower elevations that preserves the world's finest example of a temperate deciduous forest. Along the park's mountain crests, more than 6,000 feet high, stretches a conifer forest like those found in central Canada. The park has been designated an International Biosphere Reserve in recognition of the more than 1,500 kinds of flowering plants it contains, and animals such as wolves, elk, and river otters have been reintroduced into its environment. The desire to conserve this environment led to an unfortunate decision in the park's early days to eradicate all human traces from the land. Consequently, the National Park Service destroyed most of the structures left behind when inhabitants moved out. Only later did park managers change their philosophy to allow the preservation of cultural history. The most significant examples of the amended policy are the restoration of some structures in Cades Cove and in the Cataloochee Valley. As a result of the new policy, the park has been designated a World Heritage Site, unfortunately not before much of its historical and cultural importance was destroyed. 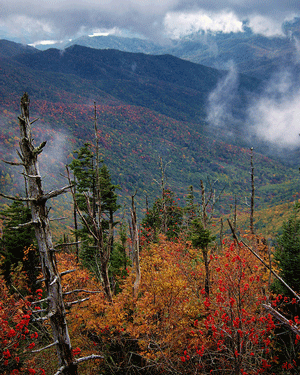 Today, the environmental purposes of the Great Smoky Mountains National Park are seriously threatened by air pollution generated outside its borders, and its name, originally a romantic description of the natural haze created by the respiration of its massive forests, is now, ironically, more technically accurate.